On the morning of Thursday, February 21, we awoke in Franz Josef to find that the weather was still perfect. Since we expected the cycling to be easier, we headed north, aiming for Harihari. Just a few kilometres north of Franz, we stopped for a few minutes by the shore of Lake Mapourika. 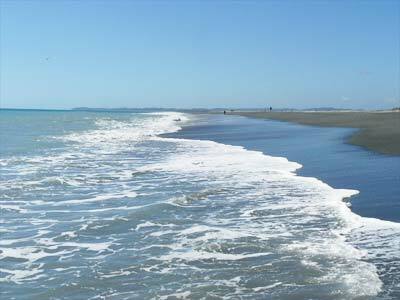 Then, just a few kilometres farther, we were tempted by a turnoff to Okarito, a tiny village on the beach. We rode the 13 kilometres down there (and up a surprisingly steep hill) and decided to spend the night. There was a domain campground with hot showers and even a kitchen of sorts (with only a fridge and sink, no stove). It was quite a popular spot, with vans and tenters from all over, but no other cyclists. The beach was beautiful. Wally took a swim in the ocean before reading notices that one should not swim there because of dangerous currents. In any event, the water was cool but still pleasant, and he survived. There was a lagoon that was safe for swimming, where we both went in. After a sunset that was a pretty but not spectacular sunset, a full moon rose over the beach. The next morning we left Okarito for Harihari. On the way out of the campsite, Barbara had one of her few mishaps on the bicycle. She was not pleased that I snapped a picture of her before helping her up! Little damage done, however, only a sore wrist and bruises. 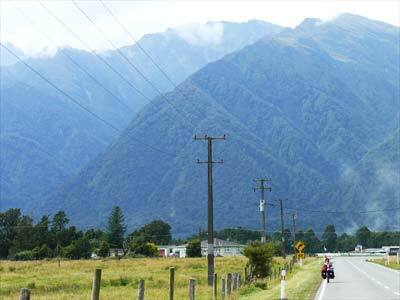 Soon we were riding along Route 6, the main road, passing Lake Wahapo (left). In the village of Whataroa, we visited a gallery of Maori arts and crafts  much of it the work of the proprietor. Some of the carving was remarkable. The carving below is done on the the jawbone of a whale that died over 3500 years ago. It depicts Maori legend in which warriors, tired of the dark, drag the sun from the sky so that they will have more light. The other side of the jawbone also bore an equally intricate carving. Also in Whataroa we ran into Dave and Jo, with their friend Mark from Australia and South Africa. 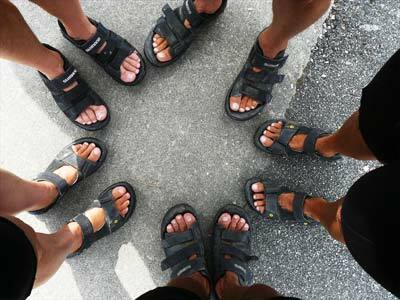 When we noticed that all of us were wearing Shimano SPD sandals, we took a photo; perhaps Shimano would like to use it in an advertisement! The ride to Harihari was exceptional, with far better views of the mountains than we had expected. With the exception of Mount Hercules  a damned difficult climb of two or three kilometres  the cycling was easy. We arrived in Harihari around 2 p.m. on Friday, February 22, after only 57 kilometres of cycling. That was enough to bring our distance to 2400 kilometres, 1500 miles. The weather was darkening, and the forecast was for rain, so we decided to lay over inside for two nights. On the way to Harihari. The government wants to change the name from Harihari to Hari Hari. There is much dispute over it among locals.. There was a festival scheduled for the weekend, the centennial of the village, that we thought might be fun. Also, Barbara had sprained her wrist on a near-fall climbing up Mount Hercules, and we were both ready for a little time off the bike. We stayed in a small "backpackers' room" at the back of the surprisingly large hotel. Every other room in the village was filled because of the celebration. The hotel pub was standing room only all evening. The flowers on the right grew in the front yard of a main street home. The centennial celebraion at Harihari on Saturday morning began with a parade featuring a couple of local bands, people in period costumes, and old cars. At the playing field, we enjoyed watching the ladies' hoop race and the men's hay bale carrying competition, among other things. The hay bale business was brutal. It was a competition of strength and endurance. Competitors had to carry two bales back and forth from one end of a field to the other, as many times as possible, without ever setting down the bales. Family portrait. Most local people wore period clothes for the event. We pride ourselves on doing this bike tour in our 60's. The gentlemen on the right in the photo above was much, much older, yet he mounted a penny-farthing bike and rode up and down over the parade route (right). He asked me (Wally) if I'd like to give it a go, but when I saw how far one could fall onto the hard pavement, I didn't have the nerve! On Sunday, February 24, we rode north from Harihari. We'd expected and prepared to ride in the rain, but the weather cleared quite quickly, and it was an enjoyable day of cycling. There were a few lakes along the way; the photo below is Lake Ianthe, looking south, 20 kilometres beyond Harihari. We stopped briefly at Pukekura, noted mainly for a tourist cafe with a giant sandfly out front (below left). Not long before Hokitika, in the village of Ruapapa, a house was nearly surrounded by carved tree stumps (below right). We decided to push on just a bit farther after shopping in Hokitika. We ended up only a few kilometres to the north at a particularly nice motor park/campground owned by a woman we'd read about. She sells sock-knitting machines all over the world, and a newspaper article described her effort to open a museum in Hokitika featuring antique sock-knitting machines. How's that for a tourist attraction! Her motor park/campground was called Beachwalk Holiday Park, and it was excellent. Barbara maintains it may have had the best shower anywhere. There was indeed a path to a wonderful, wild beach. The day's ride came to 82 kilometres and brought us to approximately half-way up the west coast.